Livy enables programmatic, fault-tolerant, multi-tenant submission of Spark jobs from web/mobile apps (no Spark client needed). 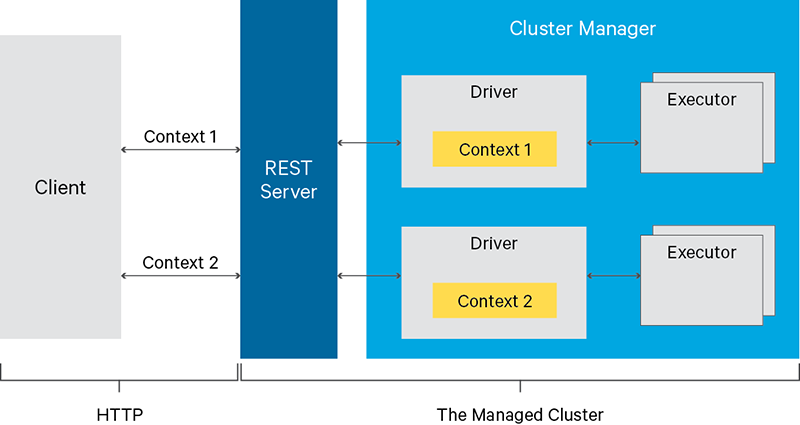 So, multiple users can interact with your Spark cluster concurrently and reliably. Livy speaks either Scala or Python, so clients can communicate with your Spark cluster via either language remotely. Also, batch job submissions can be done in Scala, Java, or Python. Don’t worry, no changes to existing programs are needed to use Livy. Just build Livy with Maven, deploy the configuration file to your Spark cluster, and you’re off! Check out Get Started to get going. To learn more, watch this tech session video from Spark Summit West 2016. Apache Livy is an effort undergoing Incubation at The Apache Software Foundation (ASF), sponsored by the Incubator. Incubation is required of all newly accepted projects until a further review indicates that the infrastructure, communications, and decision making process have stabilized in a manner consistent with other successful ASF projects. While incubation status is not necessarily a reflection of the completeness or stability of the code, it does indicate that the project has yet to be fully endorsed by the ASF. Copyright © 2017 The Apache Software Foundation. Licensed under the Apache License, Version 2.0. Apache, the Apache Feather logo, and the Apache Incubator project logo are trademarks of The Apache Software Foundation.